Como Zoo and Marjorie McNeely Conservatory provide a beautiful setting and wonderful options for your next meeting or event. Whether it’s business or social, the surrounding natural beauty and spectacular views provide elegant and unique spaces for meetings, conferences, retreats, weddings, holiday parties, birthdays, receptions and special events. We have rental spaces available in our gardens, Conservatory, Visitor Center, and zoo grounds that can accommodate groups of 20 to 500. For information about rental spaces in the gardens or Conservatory, please contact our Facility Rentals Department at 651-487-8250. 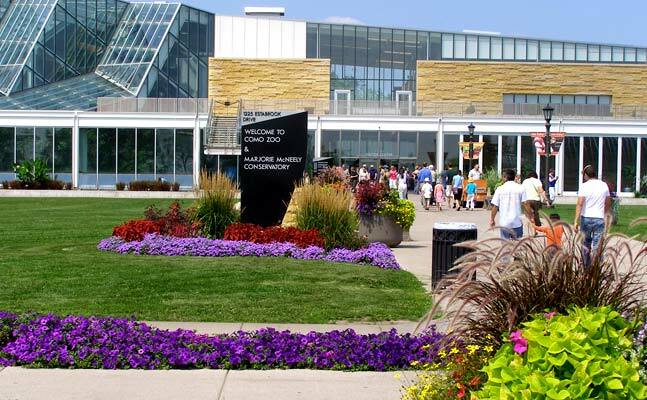 For information about rental spaces in the Visitor Center or zoo grounds, please contact Lancer Catering at 651-487-8282. Lancer Catering is the exclusive caterer for all events at Como Park Zoo and Conservatory. For more information about event planning and catering options please call 651-487-8282 or email comozoosales@lancercatering.com or visit www.lancercatering.com. Como Zoo’s Visitor Center provides a stunning venue and natural ambiance for an elegant social event or an efficient setting for a business conference, executive retreat or corporate meeting. Ambiance abounds in the Visitor Center, which features 65,000 square feet of space including private rooms for meetings or social events. It’s perfect for sit down dinners, buffets or cocktail receptions for 20 to 500 guests. Overlooking the well-manicured lawns of Como Park, the Porch features beautiful vistas no matter what the season. Gracious and beautiful appointments make this room a favorite for larger gatherings while still preserving an intimate atmosphere. Just outside the floor to ceiling windows, a pristine water lily pond enhances the front of the facility. From the second floor of the Visitor Center, the Bullard Rainforest Auditorium has spectacular views of the Bird exhibit and surrounding zoo. This space is excellent for larger business meetings, receptions or corporate events. Nestled on the second floor of the Visitor Center, these intimate spaces offer the opportunity to overlook the upper canopy of the Tropical Encounters exhibit. Drawing inspiration from the tropics, you will experience the sights and sounds of an ecosystem from above. Perfect for a medium sized group that seeks space for a business meeting or traditional classroom, these rooms offer a setting for lectures, meetings and corporate events. Adjoining the South Patio, the Zobota Café provides views of the Bird Yard and Como Zoo grounds. This space is well-suited for evening receptions. Located adjacent to the new Polar Bear Odyssey exhibit, this intimate space is perfect for small receptions. The Lodge offers up-close views of the Polar Bear Odyssey exhibit and pre-function reception space features underwater and up-close viewing of the bears. Step outside onto our beautiful terrace where vistas of Como Park and the Marjorie McNeely Conservatory open up before your eyes. Spring and summer offer a view of sweeping flower gardens and majestic trees. Fall brings its own wonders of bright colors. Located just outside the Visitor Center, this space offers an expansive view and is perfect for larger outdoor events. The Sunken Garden presents a different seasonal floral backdrop throughout the year while the North Garden features a lush tropical garden for a small intimate group or event. Check out our “Attractions” page for detailed information on each garden. The Sunken Garden Located inside the Marjorie McNeely Conservatory, the Sunken Garden provides a stunning and romantic location for your ceremony. The Sunken Garden is the home of the Conservatory’s seasonal flower shows. Accommodates 90 to 100 people standing. The North Garden is an intimate, tropical garden inside the Marjorie McNeely Conservatory featuring spice and fruit trees lining a figure-eight shaped pool. Surrounding blooming orchids provide accents of color in this lush space. Accommodates 30 to 35 people standing. The Ordway Gardens & Charlotte Partridge Ordway Japanese Garden Newly reconstructed in 2012, The Ordway Garden is a secluded, serene indoor and outdoor space available for private rentals during the summer. The Charlotte Partridge Ordway Japanese Garden, with its beautiful waterfall and reflecting pool, provide a peaceful and one-of-a-kind setting. Accommodates 35 to 100 people. The Excedra is a stunning outdoor setting located in front of the Marjorie McNeely Conservatory, overlooking the scenic Frog Pond and surrounded by magnificent pine and fir trees and adjoins the Enchanted Garden. Accommodates 50 people standing or 15 people sitting. The Enchanted Garden Located just outside the Marjorie McNeely Conservatory, the Enchanted Garden features a beautiful seasonal display of annuals and perennials with views of the Conservatory, Frog Pond, and Excedra. To reserve a garden space, contact our Facility Rentals Department at 651-487-8250. 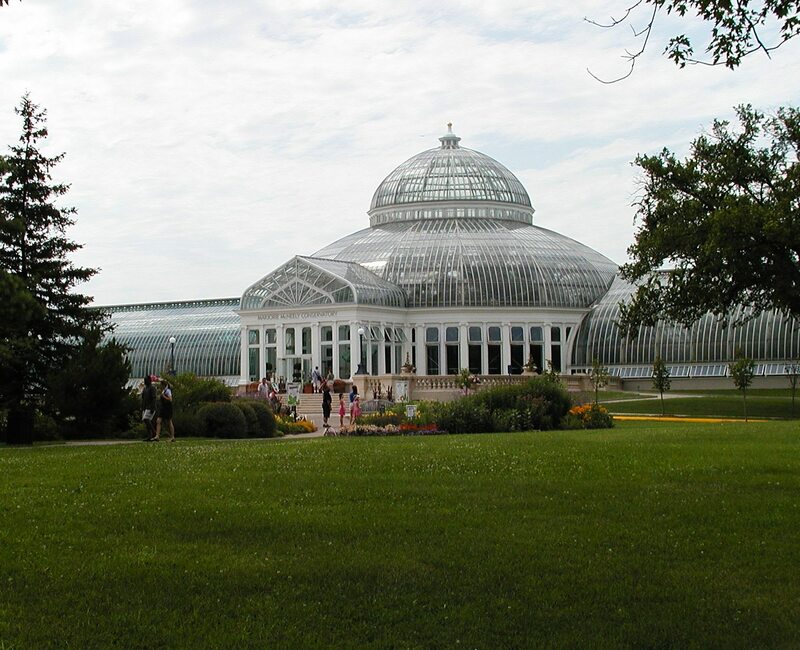 The spectacular beauty and elegance of the Marjorie McNeely Conservatory, combined with the dramatic setting of the Visitor Center, allows you to host a corporate event, a wedding ceremony or a reception at Como Park Zoo and Conservatory. The Conservatory can be rented for receptions. The entire Marjorie McNeely Conservatory can be rented for a ceremony followed by a cocktail and hors d’oeuvres style reception. To reserve a space in the Conservatory, contact our Facility Rentals Department at 651-487-8250.